(17/P10) TRENTON – A benchmark study by the U.S. Geological Survey (USGS) and commissioned by the Department of Environmental Protection and Delaware River Basin Commission shows that levels of algae-causing nutrients in waterways are largely declining or holding steady, a positive sign for water quality in New Jersey, Commissioner Bob Martin announced today. The DEP commissioned the USGS to analyze data from 28 monitoring stations for long-term trends in levels of nitrogen and phosphorous present in waterways. In all, the USGS analyzed more than 82,000 data points collected over a 41-year period from a variety of urban, suburban, agricultural and protected areas. While phosphorous and nitrogen are naturally occurring and necessary for aquatic systems, excessive levels degrade water quality by exacerbating algae growth, which affects habitat for fish and other aquatic wildlife and can cause taste and odor issues in treated drinking water supplies. Excessive algal blooms also diminish recreational enjoyment of waterways. 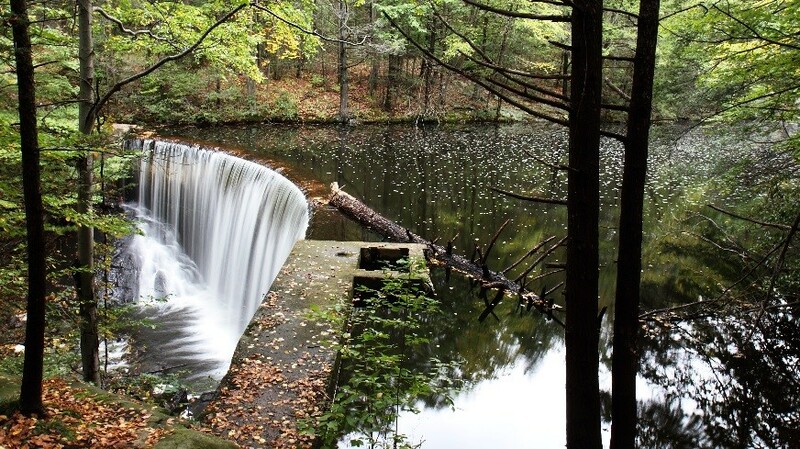 The most common sources of excessive nutrients to waterways are discharges from wastewater treatment plants; runoff containing residential and agricultural fertilizers, as well as animal wastes; and outdated or improperly functioning septic systems. At 25 of the 28 study sites, concentrations of phosphorous and all forms of nitrogen decreased or did not change significantly. An upward trend in phosphorous levels was observed at a station at the West Branch of the Wading River in Woodland Township, Burlington County. Nitrogen levels increased at just two stations, one at the Toms River in Toms River, Ocean County, and the other at the Cohansey River in Upper Deerfield, Cumberland County. The results of the study will enable the DEP to conduct more comprehensive research into factors behind these changes. The study found that water quality improvements took hold in the 1980s into the 1990s as wastewater treatment plants were modernized, in many cases regional plants replacing small local plants. During the same period, the state also ratcheted up its efforts to better manage stormwater through its municipal stormwater permitting program. This program requires local governments to implement stormwater control standards and best management practices for development projects, protect watersheds through steps such as animal waste ordinances, educate the public on impacts of stormwater, and take other steps to mitigate the impacts of stormwater runoff. Over the years, the state has implemented rigorous standards for industrial and wastewater discharges, known as point sources, and is implementing innovative programs to address combined sewage-stormwater discharges in urban areas with antiquated infrastructure. However, stormwater runoff pollution, also called nonpoint source pollution, is more difficult to address because of its widespread nature. In 2011, Governor Christie signed into law one of the nation’s toughest fertilizer laws. Now fully phased in, the law requires applicators to utilize best management practices when they apply fertilizers near waterways, requires certifications for professional applicators and lawn-care providers, and requires manufacturers to reformulate fertilizers to reduce the impacts of phosphorous and nitrogen on waterways. 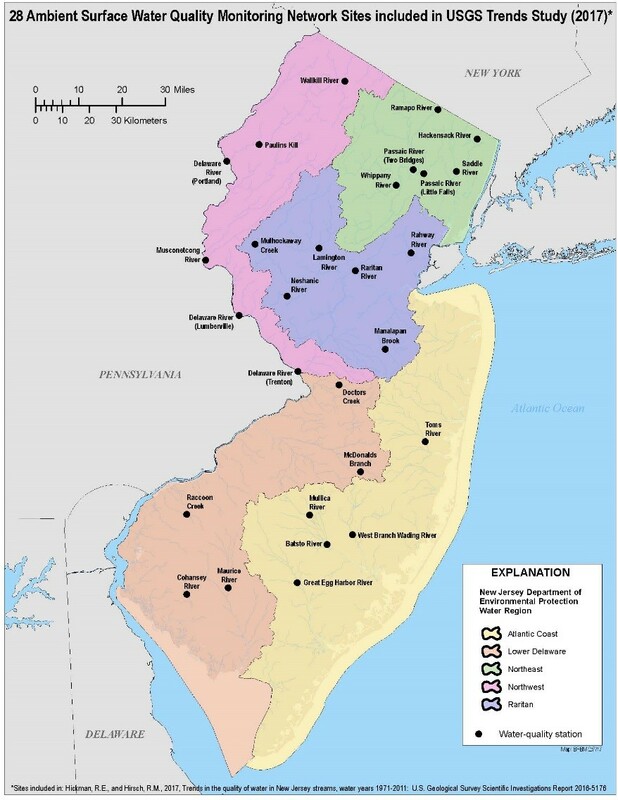 The statewide fertilizer law was a product of the Christie Administration’s comprehensive strategy to address water quality in the highly populated and ecologically sensitive Barnegat Bay watershed. This effort includes making tens of millions of dollars available to local governments for improved stormwater infrastructure, extensive scientific research on indicators of bay health, and an extensive public awareness effort that includes periodic watershed-wide volunteer trash cleanups. The USGS launched its nutrient evaluation in 2012, reviewing data collected between 1971 and 2011 from the state’s Ambient Surface-Water Quality Monitoring Network, which today includes 73 fixed locations. The compilation of the final report entailed extensive data analysis with state-of-the-art statistical methods. The USGS selected monitoring stations that had the longest available data sets. The sampling points included were among the first established as part of the monitoring network.